This moist and fruity cake can be made now so that it matures, and is ready for the marzipan and icing the week before Christmas. Feed with brandy, rum or orange liqueur to give it a rich, festive flavour and even moister texture. The suggested bay leaf and cranberry decoration is easy to create and really effective. 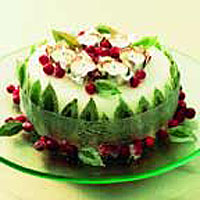 Decorate just 1-2 days before serving so the decorations stay in good condition. Once decorated, store the cake in a cool, dry place, loosely covered, until ready to serve. Place all the fruit and mixed peel in a large bowl and stir in the orange zest and juice, and the brandy. Cover and leave to soak overnight. When you are ready to make the cake, preheat the oven to 150°C, gas mark 2. In a large bowl, beat together the butter and sugar until pale and fluffy. Gradually add the eggs, beating well after each addition (if the mixture begins to curdle, add a little of the flour). Add the nuts, the soaked fruit and any liquid, and stir well. Fold in the remaining flour. Prepare the 23cm round tin (see Cook's Tips). Warm the jam with 1 tablespoon of water in a small pan. Press through a sieve into a small bowl. Invert the cake onto a flat plate or platter. Lightly knead 50g marzipan to soften it slightly, then roll small pieces into thin sausage shapes and use to fill any gaps between the cake and plate or platter. Brush the jam over the top and sides. Roll out the remaining marzipan to a 35cm round. Lift it over the cake and ease to fit around the sides, making it as neat as possible around the base. Trim off the excess with a sharp knife. Lightly knead the ready-to-roll icing on a surface dusted with icing sugar. Roll out to a 35cm round and lift it over the cake. Ease the icing to fit around the sides of the cake to eliminate as many creases as possible. Trim off the excess around the base. Using the palms of your hands, lightly dusted with icing sugar, use a polishing action over the top and sides of the cake to make the icing as smooth as possible. To frost the bay leaves and cranberries, place the egg white and caster sugar in two separate small bowls. Using your thumb and forefinger or a small paintbrush, coat about 0.5cm of the edge of each leaf with egg white then sprinkle with the sugar. Brush half the cranberries with the egg white, then sprinkle with sugar. Leave to dry in a cool dry place. Beat the icing sugar in a bowl with 1 tablespoon of cold water to make a smooth paste. Using a palette knife, spread half the paste in a band around the side of the cake. Reserve 5-6 bay leaves. Arrange the rest around the side of the cake, with the frosted side facing outwards, pressing them gently into the icing paste. Wrap the string, ribbon or raffia around the cake and secure in a bow. Arrange the nightlights on the top of the cake, spacing them slightly apart and securing with more icing paste. Just before serving, pile up most of the cranberries around the nightlights, then scatter the remainder around the base of the cake. Prop the reserved bay leaves among the cranberries. To prepare a 23cm round cake tin, line the base and sides with a double thickness of baking parchment, cut so it comes 5cm above the edge of the tin. Fold a double band of brown paper around the outside of the tin and secure with kitchen string. Stand the tin on several sheets of newspaper of brown paper. Wrapping the tin in brown paper stops the edges of the cake from drying out before the centre is cooked and helps to keep it moist. Covering the top with a piece of folded baking parchment will also stop it overbrowning before the centre is cooked. To feed the cake, every 2-3 weeks prick the surface with a fine skewer and spoon over 2 tablespoons of Waitrose Brandy. Do not overfeed or the cake will become soggy and pudding-like. The alcohol in which the fruit is soaked evaporates during cooking, but if you would prefer not to use any alcohol, soak the fruit in an extra 100ml freshly squeezed orange juice instead. If a dome forms on the cake during cooking, slice off the top just before covering with marzipan, to create a flat surface. Make sure the bay leaves on the cake are kept away from the nightlights and never leave burning candles or nightlights unattended. Take care not to allow the nightlights to burn too long at a time, as they will melt the icing if they become too hot. This recipe was first published in October 2003.